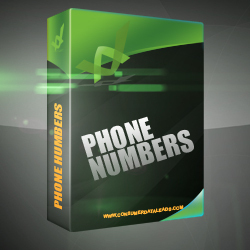 CELL PHONE NUMBERS – NAME, ADDRESS AND PHONE NUMBER ONLY. COST IS $200/MN. 1ST & LAST W/ACTIVATION. 30 DAY NOTICE TO CANCEL. UNLIMITED SEARCHES. UP TO 1500 RECORDS PER SEARCH. *WE DON’T GUARANTEE PHONE NUMBERS ARE CURRENT, DUE TO THE EASE OF DISCONNECTING PHONES AND CHANGING NUMBERS. DATA APPEND PROGRAM – update missing phone information from your current list. 15 Tokens/record. *WE DON’T GUARANTEE PHONE NUMBERS ARE CURRENT, DUE TO THE EASE OF DISCONNECTING PHONES AND CHANGING NUMBERS. DATA APPEND – GET EXPIRED LISTING PHONE NUMBERS – Give us your Expired Listing list in excel and WE can append … … phone numbers to your list. *WE DON’T GUARANTEE PHONE NUMBERS ARE CURRENT, DUE TO THE EASE OF DISCONNECTING PHONES AND CHANGING NUMBERS. PREMIUM PACKAGE – *WE PROVIDE PHONE NUMBERS IF AVAILABLE FROM THE COUNTY RECORDER’S OFFICE WITH PREMIUM PACKAGE; WE DON’T GUARANTEE PHONE NUMBERS ARE CURRENT, DUE TO THE EASE OF DISCONNECTING PHONES AND CHANGING NUMBERS. STARTER PACKAGE – *WE PROVIDE PHONE NUMBERS IF AVAILABLE FROM THE COUNTY RECORDER’S OFFICE WITH OUR STANDARD PREMIUM PACKAGE; WE DON’T GUARANTEE PHONE NUMBERS ARE CURRENT, DUE TO THE EASE OF DISCONNECTING PHONES AND CHANGING NUMBERS. BULK DATA – *WE PROVIDE PHONE NUMBERS IF AVAILABLE FROM THE COUNTY RECORDER’S OFFICE WITH OUR STANDARD PREMIUM PACKAGE; *WE DON’T GUARANTEE PHONE NUMBERS ARE CURRENT, DUE TO THE EASE OF DISCONNECTING PHONES AND CHANGING NUMBERS. MYZIPCODE FARM – *WE PROVIDE PHONE NUMBERS IF AVAILABLE FROM THE COUNTY RECORDER’S OFFICE WITH OUR STANDARD PREMIUM PACKAGE; *WE DON’T GUARANTEE PHONE NUMBERS ARE CURRENT, DUE TO THE EASE OF DISCONNECTING PHONES AND CHANGING NUMBERS. *Phone numbers are scrubbed with the DNC registry – we do not guarantee phone numbers! *We are happy to provide phone numbers (No Email Addresses) with our standard data packages at no extra charge; these numbers come from county recorder’s office records. We cannot guarantee these numbers are current, due to the ease of disconnecting phones and changing numbers. Requesting only records with phone numbers will reduce the number of records we can provide. We do not provide email addresses with our standard data packages, but we are able to send emails for you (this service is included in the Premium Package). *DATA APPEND is a prepaid service, and you only pay for what you receive. This is not a monthly charge, nor are you under contract. Any tokens not used for your order will remain on your account and can be used at any time for future lists. The cost is $103 for 10,000 tokens; each record we run is 2 tokens, every phone number appended is 15 tokens, and every email address appended is 15 tokens. Not every record will have a phone number/email; if we cannot append a phone or email to the record, you are not charged the 15 tokens for that record.